Our next guild meeting will be Saturday, August 12, 2017 from 1:30-4:30 p.m. in the Contemporary Arts Center at the fairgrounds. We will have a drawing this month – so for those who won something last time, please bring something this time! 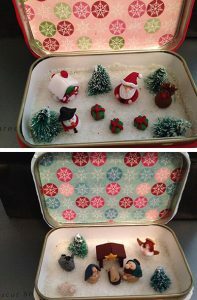 For the August meeting, Wendi McKinnon will lead us in creating a Christmas scene or a Nativity scene in an Altoid tin. We will be focusing on the figures inside the tin during the meeting. The outside of the tin will be your own design.